Finland’s Muslim population could increase by more than four times, while the UK could see an increase of 2.65 times in little more than a decade, according to projections. Around 6.3% of the UK’s population is currently Muslim – compared to the average percentage of 4.9% across Europe. The country will potentially reach 17.2% in the high migration scenario, the Washington-based Pew Forum report suggested. In one of the projections, Spain will have a 17.4% Muslim population. The report said countries like Germany and Sweden would see the biggest growth. “Countries that have received relatively large numbers of Muslim refugees in recent years are projected to experience the biggest changes in the high migration scenario,” it said. 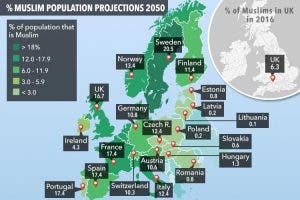 The highest possible change will see one in five people in Germany as Muslims by 2050, while Sweden is expected to see almost one in three. Europe’s Muslim population was predicted to grow by 7.4% if migration stopped completely. The UK is the desired destination for a larger number of migrants from outside Europe, with 1.6m people arriving in the country between 2010 and 2016, according to the report. It added that predicting migration levels is almost impossible given how drastically new policies or economic changes can alter outcomes. The report was produced by Pew Research Center as part of the Pew-Templeton Global Religious Futures project, which analyses religious change.